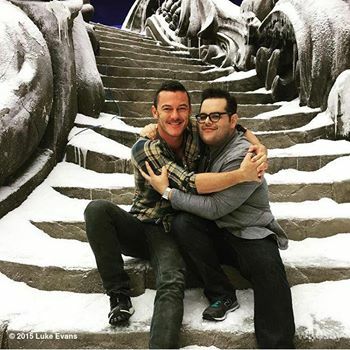 Luke Evans and Josh Gad on set of Beauty and the Beast. . Wallpaper and background images in the Beauty and the Beast (2017) club tagged: photo luke evans josh gad beauty and the beast on set. This Beauty and the Beast (2017) photo contains triceratops. There might also be mabigat na dala, green beret, mga espesyal na pwersa, and pili kawal.